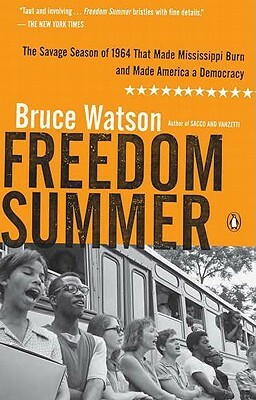 In his critically acclaimed history Freedom Summer, award- winning author Bruce Watson presents powerful testimony about a crucial episode in the American civil rights movement. During the sweltering summer of 1964, more than seven hundred American college students descended upon segregated, reactionary Mississippi to register black voters and educate black children. On the night of their arrival, the worst fears of a race-torn nation were realized when three young men disappeared, thought to have been murdered by the Ku Klux Klan. Taking readers into the heart of these remarkable months, Freedom Summer shines new light on a critical moment of nascent change in America. Bruce Watson is an award-winning journalist whose articles have been published in Smithsonian, Los Angeles Times, Boston Globe, San Francisco Examiner, Yankee Magazine, and The Best American Science and Nature Writing 2003. "Recreates the texture of that terrible yet rewarding summer with impressive verisimilitude." "Remarkable...a well-researched, vivid retelling of the 1964 civil rights crusade to put Mississippi's 200,000 disenfranchised blacks on the voting rolls...[an] important book." "Elegantly written...A fascinating look at ordinary people at their best and worst...Riveting." "An amazing account of one pivotal summer in the history of civil rights...with a thriller's pacing, the book forcefully describes the depravity and treachery behind the bombings, beatings and intimidation...and shows the physical and emotional costs of such a fight."